Capital abundance, low interest rates, and high volatility are creating new challenges and opportunities in equity markets. To succeed in this crowded and complex global landscape, you must take your investment expertise to a new level. 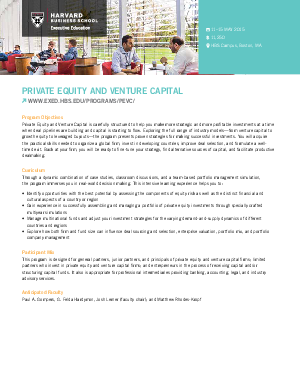 Private Equity and Venture Capital, an Executive Education program at Harvard Business School, explores cutting-edge industry models and related issues—from venture capital, growth equity, and buyouts to industry infrastructure, portfolio strategies, and decision-making processes. Designed to improve your effectiveness at all stages of a deal, this program examines innovative approaches to asset management, financial strategy, organizational structure, and portfolio management. You’ll learn how to improve your negotiation approach, identify solid investment opportunities, manage asset inflation and bubble risks, and generate long-term returns to secure a competitive advantage for your company.